Who does not love orchids? My grandmother is fond of orchids and she has a wide collection of them. I remember growing up she would assigned me to water her orchids as part of my daily chores after school. I fell in love with plants and flowers because my grandma was always working on her collections and she's the one who taught me how to care for orchids. 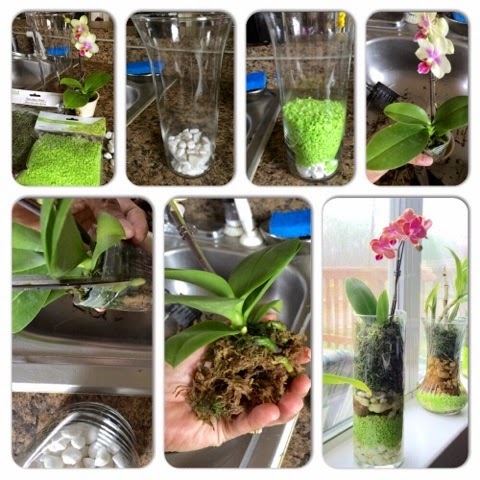 One thing I didn't learn from her is how to repot orchids in a clear vase. I have to say that orchids being planted in a clear glass vase makes it look even better. Here's how to do it! You need: pebbles, small rocks, moss, clear vase, and moss. - Put a single layer of clean small stones and pebbles in the bottom of each pot to help with drainage. - Soak the orchid's pot in water. - Remove the orchid from the pot. - Remove any rotten, damaged, or dead stems, foliage, or flowers. - Shake off any loose soil and then soak the roots in cool water. - Position your orchid in the pot and continue filling the pot with moss. - Move the plants back into the sunlight and resume regular watering. Now you don't have to worry about watering your orchids everyday. 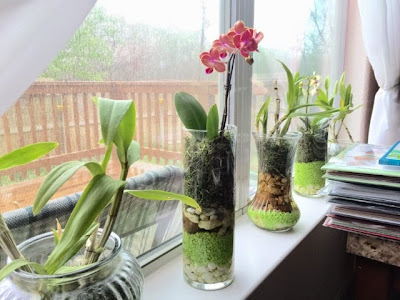 Just simply mist the moss and leaves when moss feels dry, but not to water a lot because if the root gets wet that would kill the orchid.